Ernest Cline’s “Ready Player One” is a novel filled with virtual reality, video games, ‘80s pop culture and gives us a vision for the future world. I always like the science-fiction story talking about future world, sometimes it would feel cool and fun, sometimes it played as a good reflection to our world right now. I enjoy Mr. Cline’s “Ready Player One”, even though the story’s context and structure are not too new to me, also, as a ‘90s born child, too many ‘80s-related trivia are a little difficult for me to fully understand, but over all I really appreciate wandering in the future world and the Oasis. The story is set in 2045, and the world is totally a mess at that time, with problems like overpopulation, unemployment, and energy shortages. People logs into the Oasis, a virtual reality, video game like utopia world, created by James Halliday. When Halliday passed away, he left a message to the world: there’s an Easter egg hidden inside the Oasis, and whoever finds the Easter egg would get his whole fortune as the prize. Then the hunt began. Everyone’s eager to find the clues for the Easter egg. An eighteen-year-old Wade Watts, know as Parzival in the Oasis world, is one of a gunter, short for egg hunters. The plot is the egg hunting adventure of Wade and his friends Art3mis, Aech, Daito, and Shoto, trying to find the egg and fight against Innovative Online Industries ( IOI ), a corporation bent on taking control of the OASIS with their operatives called Sixers. Eventually, Wade wins the battle, and finds the Easter egg, and meet Art3mis in person. The whole story’s like a massive hunting adventure game with a lot of ‘80s-related culture, including video games, movies, and musics. I’m the person embracing virtual reality, and I think its use is beyond fun and entertaining. With virtual reality, people can have more possibilities for achieving more things and works, anything crazy, just like what they could do in Oasis, which might be the ultimate goal for virtual reality technology. It was really interesting to read this virtual-reality-game concept story, and this led me to rethink the value and idea of virtual reality. When virtual reality becomes too real, just like reality, what is the real reality for people then? To question like this might sound a little silly, but I think in “Ready Player One”, the author was trying to throw out this question to readers. One of my favorite moment of the story was when Wade finally met Halliday in the end, what Halliday told him, “I created the Oasis because I never felt at home in the real world. I didn’t know how to connect with the people there. I was afraid, for all of my life. Right up until I knew it was ending. That was when I realized, as terrifying and painful as reality can be, it's also the only place where you can find true happiness. Because reality is real.” Halliday also told Wade not to hide in virtual world forever, and that was the mistake he made. I found the statement pretty interesting, because for most of the people, the Oasis is becoming their reality, it’s a place they spend most of their time at, and I think those people might make the same mistake as well, forget about what’s the reality. In the story, it touched a lot on this “reality” concept, Wade found his new life in Oasis, saying it was much more than a game or an entertainment platform. Those idea made me think of will our world become like this in the future, and how do human beings deal with it when it’s really happening. The same problem actually exists for long time. People always like to debate about the pros and cons that Internet brought to us, and the rise of mobile phones and tablet just made the issues more complex. It’s basically the same idea. You can almost live a new life behind the screen, becoming another person, having your own user name, and whatever avatar you like online. Some issues then raised because of the anonymous on Internet, and if we went further, pushing those things into virtual reality, the issues could get bigger. I think the problem will still remain and eventually we need to deal with it seriously while these technologies like virtual reality growing. Will people be more isolated in virtual reality? Will people be addicted to it too much? Those questions remind me another story I read ---"The Veldt" by Ray Bradbury, one of the eighteen science fiction short stories in his 1951 book called The Illustrated Man. It is a story about a futuristic world where a malfunctioning virtual reality nursery becomes a threat to the mental health of the children in a family. The situation gradually causes some drastic changes in the balance of power within the household. In that story, we see how virtual assistant, and virtual world could shape and change people’s mind and how people become too addicted to technology. From my perspective, “Ready Player One” is not really like "The Veldt”, trying to warn people about how terrible the technology would be like, something like “Black Mirror”, featuring satirical tales that explore techno-paranoia. It’s a lot of fun and entertaining, but still buries this “reality” questions under the story. I think Halliday was the one who fully believed and enjoyed himself in virtual world with all made up, new identity, and dedicated the rest of his life on building Oasis. So it was interesting to see that in the end of his life, he realized the reality world out there is still the real one, and people should not fully hide and rely on the virtual world. Perhaps there’s no real answer for the question, the virtual reality could also play as an extension for the reality world. A in-calss practice with Vuforia and Unity for AR(Augmented Reality) development. I put myself on a StarWars Tie Fighter. In this practice, I built the input control to the characters, so user could have the ability to move characters through the keyboard. Try to create a simple experimental scene in Unity and place your created character in the scene. It's a video mapping practice. I used two projectors at the same time, and also used the projection mapping software MadMapper. Trying to create a under water scene. Ideas: quick change against the clock- video game? In-person game? Video? Like a city scavenger hunt. The assignment was picking a well known fairy tale and re-imagine the story through an alternate medium. We decided to use "Cinderella" as our story, and played with the themes of time constraint, finding the shoes that fit, from the origin story of Cinderella. This is the conceptual prototype we built--- a dating app for people to play with. The prototype was designed in Sketch and InVision. 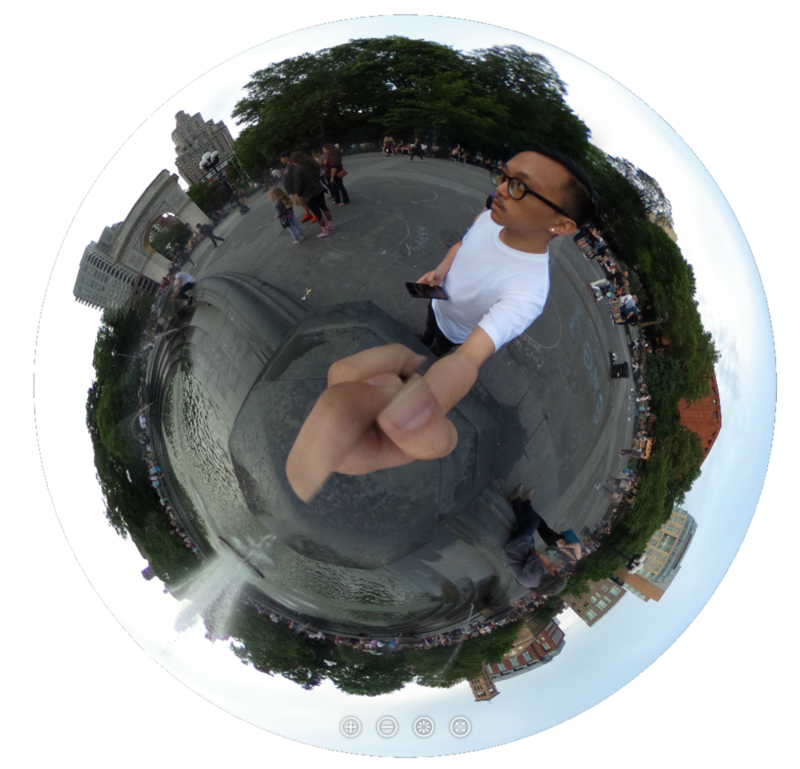 We used Ricoh Theta and did the basics of shooting 360° Video. 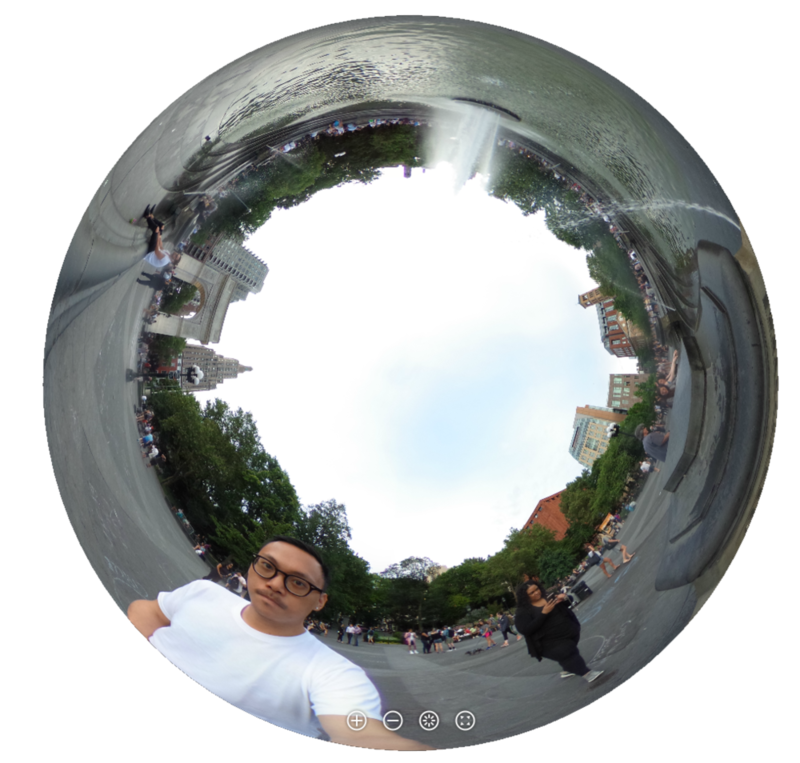 I went to Washington Square Park to shoot those360° photos and videos. It was my very first time shooting360° contents, even though I've several experience in watching360° contents. I learned not to move too quickly during shooting, especially turned around too quickly, which would make audience feel sick easily. So what I did more were holding camera at a specific place and tried not to move. It was such an interesting experience for me, not only learning how those360° videos contents were made, and also seeing the footages you shot yourself immediately after exporting them were really fun.